What would you do if you had 25 hours in London? In October, Mr. Zeus had an overnight business trip to London, and so we found a cheap flight for me and I got to tag along. We landed at Heathrow Airport and took the express train into the city to Paddington Station. At this point I couldn't quite believe that I was really in London. For all the to-ing and fro-ing between the States and Switzerland, I'd never been in London (or England that matter, if you don't count Heathrow airport and that was only this summer). I grew up reading English children's literature and then English grown-up literature, so there is a lot of intellectual knowledge of England inside the brain, (or at least literary knowledge) but no experiential. When I saw the first London Underground sign from the train , I had that same feeling I had twenty years ago when I caught a very distance glimpse of Sacre Coeur from a bus window when I was arriving in Paris. It really does exist! I'm really here! This wasn't at all what I expected it to look like! It is exactly what it is supposed to look like! So this is a picture of Zeus looking at his wife who has gone all giddy and young and adventuresome and picture happy. We walked through Paddington Station and I kept looking around for the Mr. Brown and the bear. From the station we walked through some well-to-do neighborhoods to Hyde Park. In between the main streets, there were the Mews, little alleyways that led back into what must have once been the gardens and stables back in the day, but have been converted into homes. It helped make sense of a lot of old books -- how Little Diamond could sleep over the stable for instance. Look out, the Dementors will get you!! With Zeus settled into the hotel room to finish up some work, I ventured out on my own to explore. It felt crazy to be on the loose on my own in such a huge city filled with so many people! For about two minutes I felt a little scared. Then I changed my mind and decided to be adventurous! I managed to figure out the Underground with some help from my handy Rick Steve's London guidebook. And I went here. Do you remember what happened here? They've set up a Platform 9 3/4 with a trolley disappearing into the wall for photo ops! Then I walked to The British Library to see the Treasures Room. In that one room are a crazy amount of pivotal documents in history and the history of literature: The Magna Carta, the Gutenberg Bible, one of the first copies of the King James Bible, Leonardo da Vinci's notebooks, letters from Mary Queen of Scots to Elizabeth I, the Canterbury Tales, original libretto from Handel's Messiah, Jane Austen's writing desk, the Lindisfarne Gospels with illuminated manuscripts, scribblings of John Lennon and Paul McCartney on the backs of birthday cards of the lyrics of Yesterday and She's Got a Ticket to Ride, etc., and one of my personal favorites: the handwritten manuscript of Jane Eyre opened to the passage, "Reader, I married him." It was overwhelming, all the goodness in that one room. But here is the thing that really took my breath away. 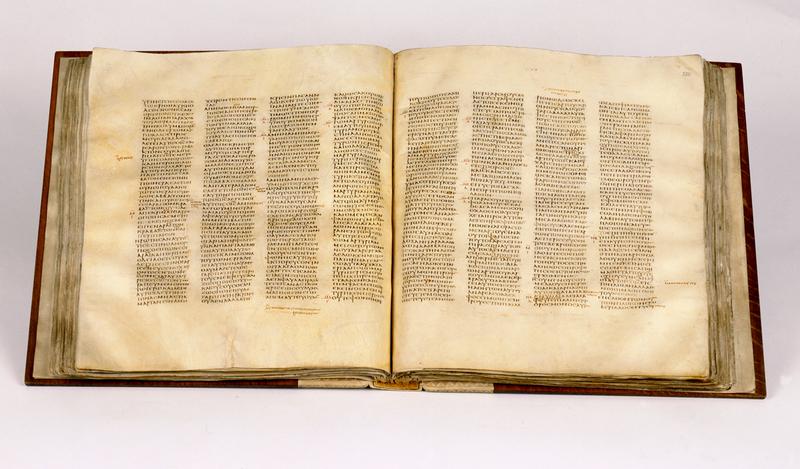 The Codex Sinaiticus -- from the 3rd century -- the oldest manuscript of the entire Bible in existence. No photos are allowed, so I got this one off the web. 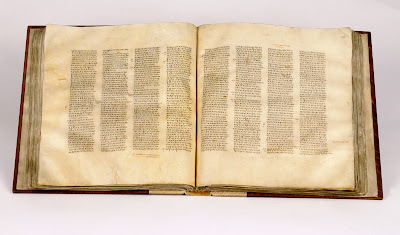 Surrounded by other old manuscripts filled with color and decoration, of Hinduism, Judeaism, Islam, Buddhism and even later illuminated manuscripts of the Bible, the Codex Sinaiticus was beautiful to me in its simplicity. It's just Greek words on a page. Yet what Words! Even just thinkng about it now, I am thinking, "Where else can I go? Only You have the words of eternal life." I thought of the scribe who carefully copied those words down sometime in the AD 200s with such gratitude. Did he have any idea what importance his work would have someday? Surely it was a painstaking task - no white out if you made a mistake. And here it is on display as one of the world's great treasures, beautiful in its faithfulness and simplicity. ...meet Zeus under Big Ben. I was later than planned because of the delay and Zeus had a policeman come check on him to make sure he was waiting for someone and not just waiting around Parliment nefariously plotting something a la Guy Fawkes. There it is! Bong, Bong, Bong. Second star to the right and straight on til morning. Then we walked and walked and walked, along the Thames, past the Ministry of Defense, through Trafalgar Square (which was smaller and more trafficky than I expected, but it was dark out and I was getting hungry, so maybe I didn't get the best view), on to Piccadilly Circus, past the Ministry of Silly Walks (!) and up Regent Street. By then I was really hungry and we'd already passed the cool looking Japanese restaurant with interactive menus in the table and the Lebanese restaurant where gluten-free options seemed plentiful. Finally we decided on a Moroccan restaurant - Momo's - in a courtyard just off of Regent Street. It was so atmospheric - I've never been to Morocco, but it felt like it might be authentic looking. Dinner at any rate was absolutely delicious: lamb tagine with pears, prunes and almonds and carmelized onions. I felt my strength returning! The next morning we woke early, had coffee and then walked the half hour to the hotel where Zeus' meeting was held. He kept our overnight bags and then I was off on my own again! I was within walking distance of Buckingham Palace so I started off. I went through Wellington's Arch. See those two ladies at the bottom of the photo? They asked me to take their photo. As I walked through the arch and down the avenue, I was passed by innumberable cyclists and runners. I never got a picture of all the runners, but London seemed to be filled with them, running, no sprinting, to work, or back home again with backpacks on. It was rather impressive and gave one the impression that exercise is not something to be trifled with! I walked and walked and began to wish that I'd rented a bicycle myself when I arrived at...Buckingham Palace. One of the funniest and most disconcerting things I found as I walked and walked and walked around was that while I had prepared myself to see cars on the left hand side of the road, I was unprepared for pedestrians following the same course of action. I kept finding myself on the right side of the sidewalk/underground tunnel/escalator heading into on-coming people, and having to scoot back left at the last minute. or coffee, in my case. I had some coffee and yogurt at a little cafe in St. James' Park with a lovely view back up to the palace. In the park I found this fancy drinking fountain. On the bottom is written: Metropolitan Drinking Fountain and Cattle Trough Association, so I had to take a picture. Nearby, a group of three young women approached me. One of them was carrying a box and I was worried that they were going to try to sell me something. But no. They asked me for directions! Ah! I thought, now I am satisfied; I can leave this city happy. This bears going into in depth, but no time right now. Suffice it to say that I've been thinking for awhile about a blog post called A Face for Directions because that's what I seem to have. Even better is that I actually knew how to direct them. At the end of the park was a sweet little house built, as the sign said, to look like a Swiss Chalet. It was built when the park was done over more naturally in the 1800s and this building was used as the gardener's house and veggie plot. Someone's been keeping Swiss Chard in it. These duckies seem pretty underwhelmed by the fact that they live within view of the Sovereign of British Empire. I walked past the duckies and on and on....to....?